In today's Top Shell: We've uncovered a Super Blooper, but is the Blooper really that Super? Plus Mario reveals his tips for cleaning red plumber hats. Pokenoz engineers say they watched the Blooper's graceful movements in the water, and wanted to move that feeling of grace and speed into the karting world. And they've hit the mark. Kind of. It looks graceful, and certainly handles better than the Wild Wing could dream. The Blooper ships from the factory with a suspension system that makes the occasional off-road excursions quick and enjoyable; though it's obviously not it's strong suit nor is it recommended for a driver that enjoys the taste of victory. This car is so properly sorted and driver friendly that a confident driver can toss the kart into a corner and hold a tight line with nary a complaint. Unfortunately there is a catch. The powerplant was not designed to handle the large amount of nitrous boosting used in MKGP, and suffers greatly coming off of corners when matched against other more powerful engines. Will this cause a problem on the Luigi Circuit, well let's get to it shall we? Some say that he is the 4th piece of the Triforce, and that in order to make him work you have to lift his mask and blow in the slot. All we know is, he's called The Stig. 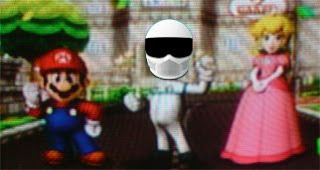 The Stig brings the Super Blooper onto the track, and through the in-kart video feed we can hear he's listening to the theme song from "The Wild One". A madcap 1953 jazz piece from composer Leith Stevens, the song alternates between rising brass notes and rapid pace drums to a more relaxed cymbal & cello breakdown. The music seems to serve to keep Stig both relaxed and pumped for each flying lap around the track. Coming across the finish, let's see where the pistons fall! Oh dear. The three lap total is only 0'00.170" faster than the Standard M. Comparing the two, it becomes obvious the Blooper's powerplant is the Achilles heel of this machine. It's ability to stick to the shorter line through a corner is negated by it's inability to capitalize on the release of nitrous during the exit of the corner. Still all things considered, a rookie driver or even an experienced veteran can be a threat to the leader with such a kart under their control. Top Shell: The Whole Kart Thing, Sorted. Welcome to the internet's only site (as far as we know) that provides humorous reviews and laptimes of the various karts and bikes available in Mario Kart Wii.